If you’ve always wanted to sail the seas of Minecraft, this mod will interest you. Archimedes Ships 1.7.2 and 1.7.10 is a fairly simple mod adding four new objects. First we have a wood block with a helm, which is the block that will allow us to manage or direct our ship. On the other hand we have some watches that will give us information through a compass, a speedometer, etc.. The mod adds two more blocks: “Floater” and “Air Ballon”. The floater is a block to float on the water, but for now is purely decorative and we can use any block to build our boat, always adhering it to the helm. The Air Ballon right now has no function, but in the future will be useful to make balloons. 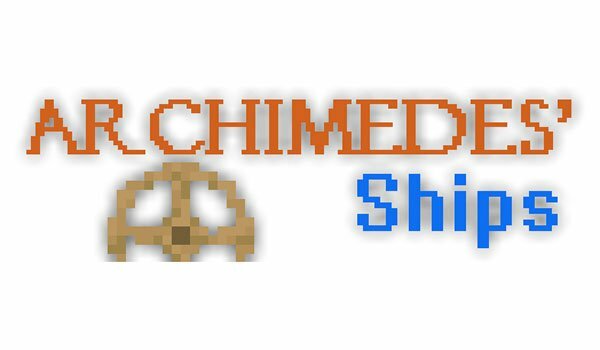 How to install Archimedes Ships Mod for Minecraft 1.7.2 and 1.7.10? after installing the mod, minecraft crashes on start and i can’t play. Any help pls? iniaa. I think your problem is that the version not the same is as the mod. Just with folder no INSTALLER!!!!!!!!!!!!! Srk i’m 12 and i’m not soo good in english! is it work on multiplayer? But not anymore i dont know why when i place blocks to my Server ffrom archimedes ships they disepear instantly! Why?